I collaborated with my client and led a multi-disciplinary team to design a new service for homeowners with structural damage from hail. Hail Hero was founded by storm restoration professionals who saw homeowners’ need for help with insurance companies and contractors. They aim to advocate for homeowners dealing with the aftermath of a hail storm. I was engaged to validate an existing concept with prospective customers and to deliver an online marketing solution. The initial target market, "homeowners with hail damage," was too broad. We narrowed the focus to a clear, research-based persona. The new focus led Hail Hero to pivot from product to service. We created a plan for delivering their unique service. See xworx.co/blog/hail-hero for a full list of my talented collaborators and their contributions. I began by immersing myself in the problem space. 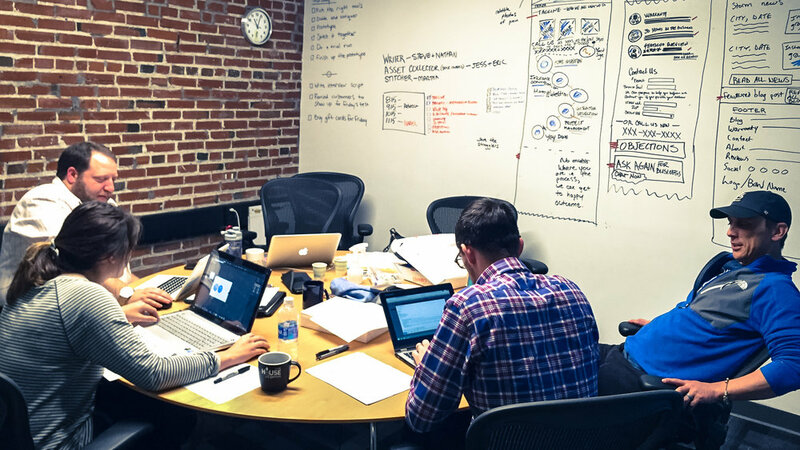 Evaluate the client’s existing conceptual prototype and branding. Understand homeowners’ hail restoration experiences, needs, goals, and pain points. This primary and secondary research yielded over 1,000 quotes, observations, and data points. We interviewed 20 homeowners and reviewed numerous publications. We collected and coded our findings so we could revisit them and filter the data. We recruited research participants through social media advertising and our personal networks, screening for home ownership and hail damage experience. We brought a prototype of the document to homeowners to observe them using it and solicit their feedback. We also showed them an early version of the marketing website to have them evaluate the value proposition. A homeowner reviews the prototype. She feels overwhelmed by long and technical report with unfamiliar and inconsistent formatting. Spontaneous co-design: This homeowner re-arranges the prototype to make it more usable. He suggests clarifications to the wording. One participant thoroughly critiqued this page of the prototype report, which explains the home restoration process. We showed homeowners the existing "Roofwrangler" branding along with several others roofing brands. Most preferred the more simplistic branding of traditional construction companies. Hail damage restoration can take months, involving many decisions and service providers. We needed to develop an understanding of the chronology. She diagrams her experience chronologically. After the research session, we photographed the steps and grouped them into stages. When it comes to building empathy, there’s no substitute for contextual user research, so we interviewed homeowners who had experienced hail damage in their homes. One homeowner showed us this sticker on their HVAC unit. To him, it signifies reliability, an important factor in selecting a service provider. This couple was in the process of disputing their insurance claim. They provided a wealth of information on what happens when parties disagree. Paperwork can multiply quickly for homeowners with complex situations. Identify opportunities to create new value for homeowners. Help the client choose a customer focus. We identified several variables within our research findings. For example, some homeowners thoroughly researched building materials, while others simply accepted their contractor’s recommendation. We plotted these variables side by side on bipolar axes. 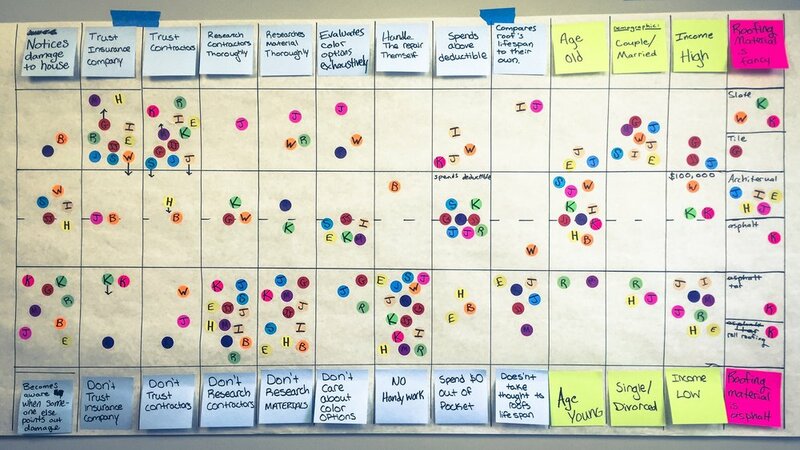 As we identified clusters of common characteristics, distinct user groups emerged. We developed a 2x2 to classify research participants into four groups based on the two defining characteristics of homeowners with hail damage: research (how much work they do to find a contractor, select materials, and understand claims) and sociability (how connected they are to their neighbors and how much they influence or are influenced by neighbors’ repair decisions). Taking the 2x2 as a starting point, we developed personas based on data from research sessions. In every neighborhood there is a “Queen Bee Kelly”, an intuitive influencer; “Researcher Rob”, an analytical loner; “Follower Francis”, who follows “Queen Bee Kelly”; and “Slacker Sally”, an indifferent person. We validated these personas with industry professionals. “Queen Bee Kelly” values dedicated personal assistance from someone she can trust to get the job done right. She has influence in her community and will reward good work with referrals to people like "Follower Francis". The needs of these two personas were too different to design for both initially. Presented with the choice, my client selected “Queen Bee Kelly”, pivoting away from the original concept towards a white glove service. We pivoted from informational product to white glove service. Designed a brand around the tastes of target customers. We collaborated with the client to produce a service blueprint. It shows the end-to-end customer experience and supporting interactions and operations. The blueprinting process surfaced potential pain points as well as opportunities to create additional value. This diagram, based on the blueprint, helps the homeowner understand the process. We rapidly designed a lead generation site through two design sprints. (We used the Google Ventures format.) Our goals were to clearly communicate Hail Hero’s new service to potential customers and to engender trust. Mapping the customer journey helped the team focus on a key point of failure: reaching new customers. At the end of each sprint, we conducted usability testing with five homeowners who fit the "Queen Bee Kelly" persona. Their feedback not only helped us improve the site’s functionality, but also informed how we articulated the value proposition. When the client renamed the service “Hail Hero”, I took on the branding. I based the creative brief for Hail Hero's visual identity on the Queen Bee Kelly persona and the nature of the service: reassuring, elite, and minimal without appearing aloof or egotistical. I hired and directed the branding team. The logo incorporates a protective shield and the roof, doors, and windows of a house. Soliciting roofing contractors can become a nuisance in damaged neighborhoods. But most roofers respect a property that has been claimed with a yard sign. Hail Hero sends its clients a yard sign to deter soliciting refers and promote its services. In new neighborhoods, Hail Hero's first customers will discover them through a location-based ads. The campaign can be targeted at zip codes in response to hail storm data provided by a 3rd party. Every call to action on the site—including the prominently displayed phone number—is equipped to analyze conversions. These tools will help Hail Hero optimize their marketing. We tested several ad copy variants. Hail Hero is ready to defend homeowners facing the aftermath of the next hail storm. 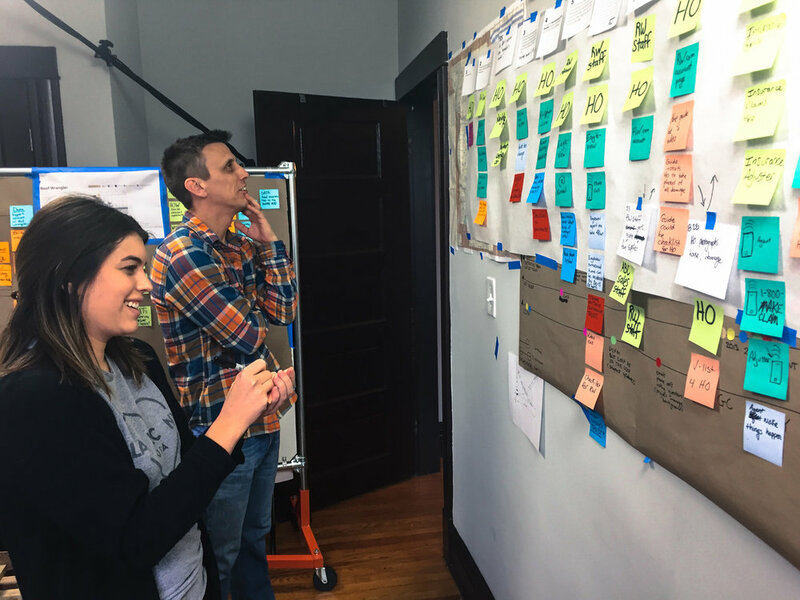 With the solid foundation of a clear customer focus, the new direction of a service blueprint, and an appealing online presence, Hail Hero is fully equipped to attract and satisfy their most enjoyable, profitable customers.